These pieces are pill-bottled-shaped liquor cabinets that convert into barstools. 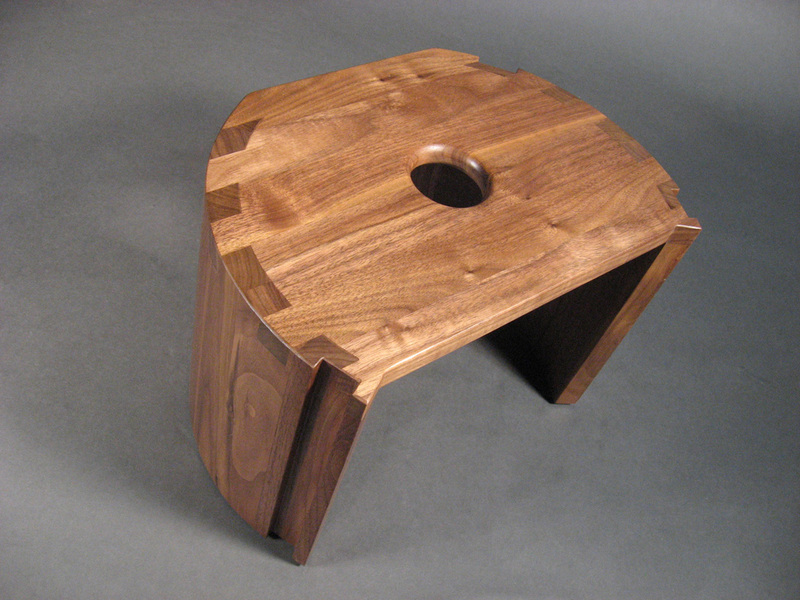 They were made for a show at the Grovewood Gallery titled “Multiple Personalities” which featured multi-functional furniture. 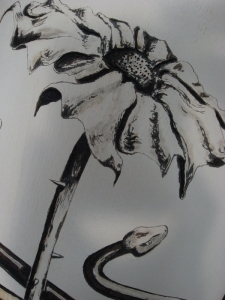 They have been exhibited many times now and are available for purchase. The artist’s statement is as follows…. The modern American pill bottle. 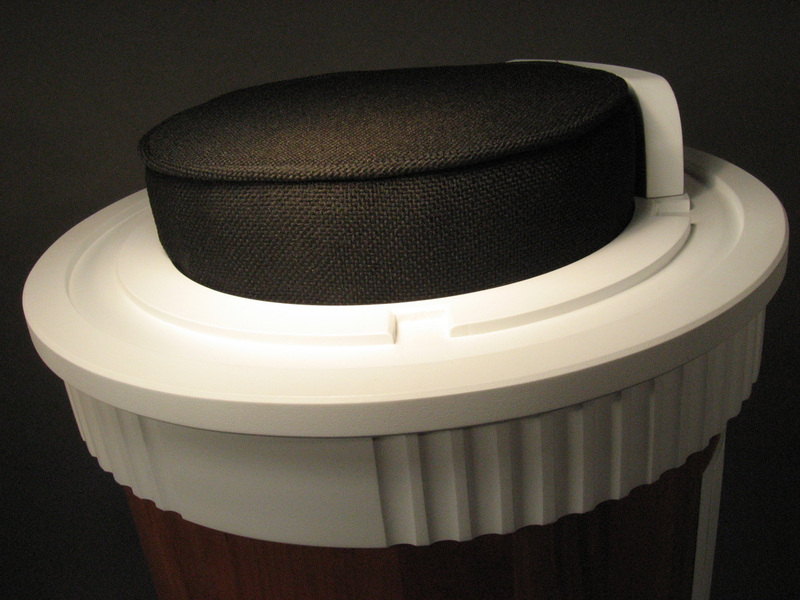 These simple components of the daily life are rather well-designed little objects. Nearly all of us have experience with them. 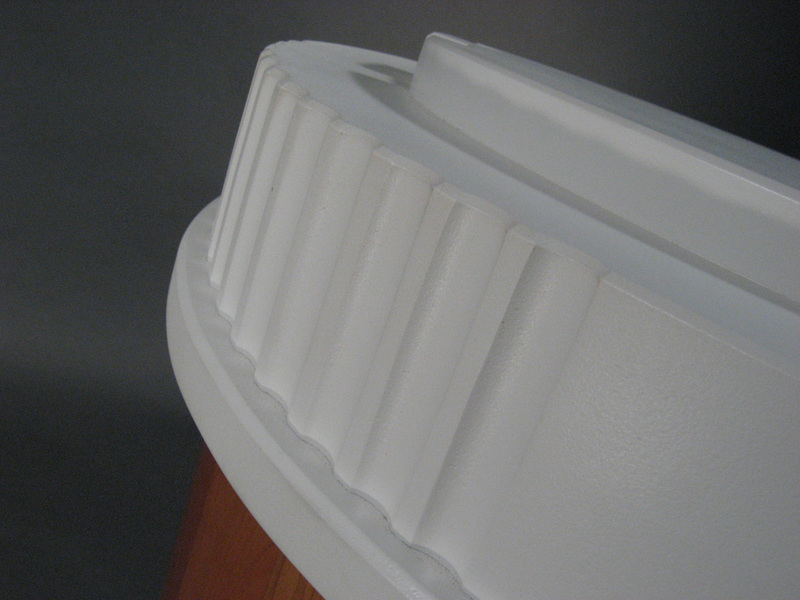 They can provide a seemingly easy and wondrous solution. They can be filled with hopes, often false, and promises, sometimes empty, of a better today, and an existent tomorrow. Though as simple as they are, they are tied to a world of political, scientific, and historical complexity. 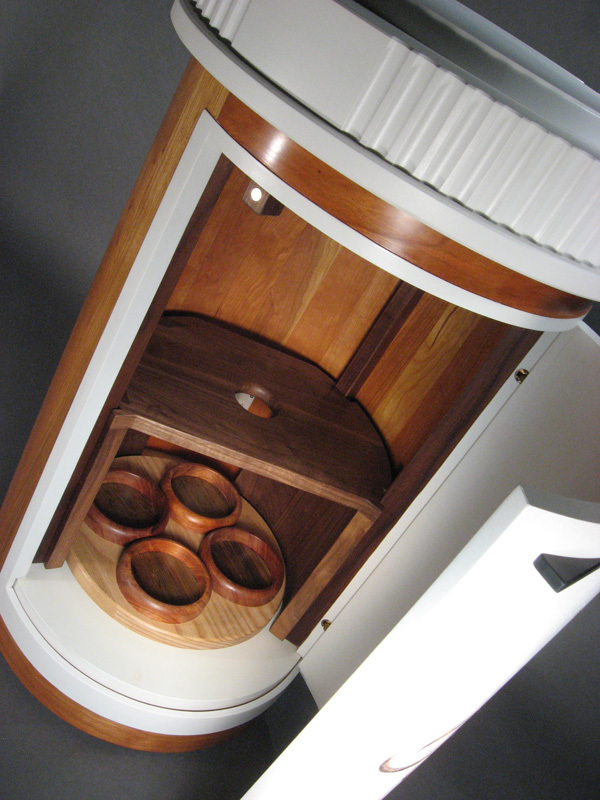 When prompted by a gallery to design a piece for a multi-functional furniture show titled, “Multiple Personalities”, I decided the common pill bottle was worth exploration. As the idea developed, I researched a number of ideas for the label. The main concept revealed itself with rather bitter irony. There are two medical symbols….sort of. 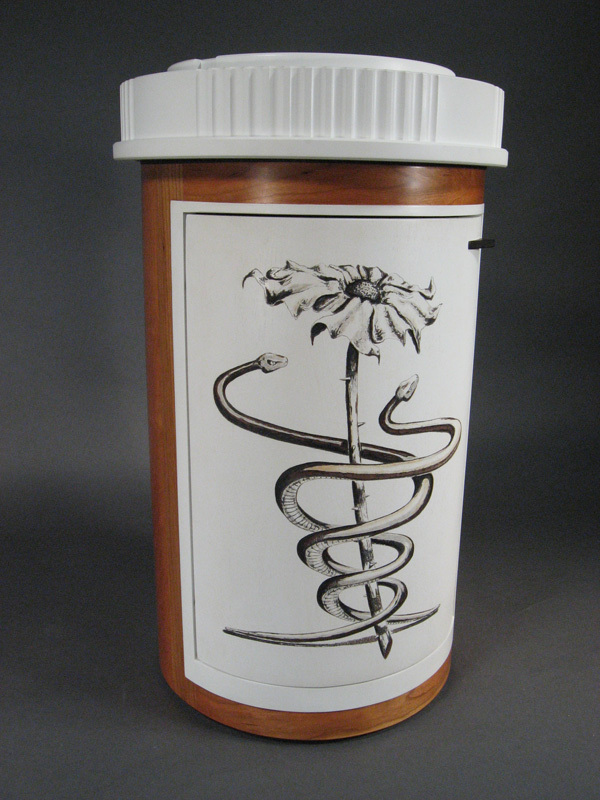 One is called the ʻRod of Asclepiusʼ. It is a single staff with a single snake wrapped around it. It is used around the world as a symbol for medical help. Itʼs on the back of most ambulances inside a blue star. This dates back to the Greek physician Hippocrates and his famed oath. 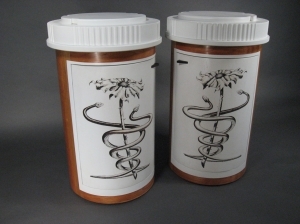 In the United States, there is another one called the ʻCaduceusʼ. This is a staff crowned with a set of wings. It has two snakes coiled around it. Historically, the Caduceus is the symbol for the Greek god Hermes, the messenger. Hermes, among other things, was the God of commerce, travelers, road-side thieves, pick-pockets, and liars. He was not a doctor. In 1902, an officer of the US Army Medical Corp tried to leave his legacy by branding the Corp with a symbol. Unfortunately, he confused the ʻRod of Asclepiusʼ with the ʻCaduceusʼ. This incident, along with a few other similar historical missteps, helped to make the ancient symbol of the God of commerce, thieves, and liars synonymous with the American medical industry and still used frequently today: a dark twist of symbolism. 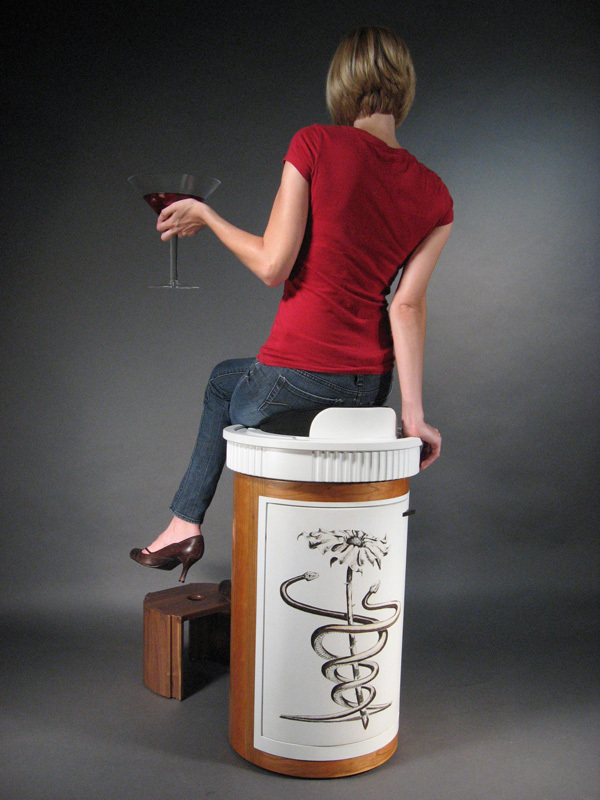 The inspired Caduceus Cabinet is a liquor cabinet made of cherry that converts to a barstool. The lid is removed, the inner shelf slides out to be used as a foot rest, and the lid is replaced after being flipped 180 degrees revealing a cushion. 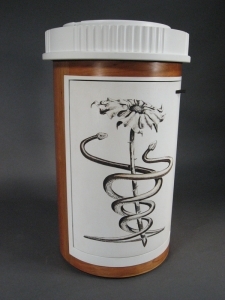 The Caduceus-like image itself on the label is carved through the white paint and into the dark walnut wood of the door, then stained black. There are two, with opposing doors.